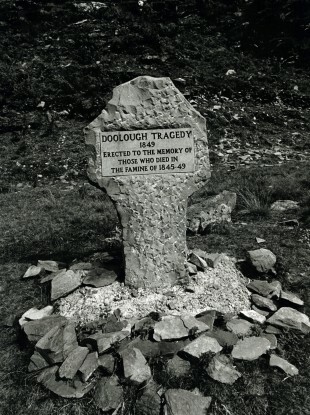 A memorial erected in Mayo to those who died in the famine from 1845 to 1849 and in the Doolough Tragedy of 1849. THE COUNCILLOR BEHIND a motion to erect a memorial to the victims of Ireland’s Great Famine in Scotland has said he is delighted that the plan received unanimous support from Glasgow City Council. SNP councillor Feargal Dalton proposed the tribute to the thousands of Irish citizens who died or fled to the Scottish city during the Irish, Highlands and Islands Famine of the 1840s. He argued that the events of the decade had a significant cultural, economic and social impact on the modern-day character of the city. Seconded by Bailie James Scanlon, a member for Southside Central, the motion also recognised the efforts made by Glaswegians to provide relief and sanctuary to those affected at the time. A working group for a memorial will meet for the first time within weeks to examine the feasibility of a memorial and report back next summer. Dalton told STV Glasgow that the memorial will highlight the charitable character that the city has and show that the Great Famine was a human tragedy which had no national or sectarian boundaries. The nature of memorial and where it may be sited have also still to be decided upon. Bailie Scanlon commented: “Both the Irish and Highland famines drew thousands and thousands of migrants to Glasgow in a state of desperate need. Email “Glasgow to erect famine memorial”. Feedback on “Glasgow to erect famine memorial”.